It was December 15, 1942, just a year after the Japanese attack on Pearl Harbor. Max Baer was thirty-three years old and his brother Buddy was twenty-seven. They had both retired from the ring in the past year. That morning they both went down to McClellan Field in California, to enlist in the Army Air Corps. The army at that time was only taking men aged eighteen to twenty-six years. 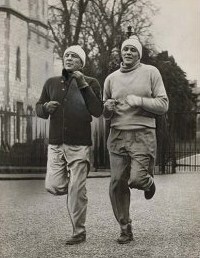 The two heavyweight contenders were told flat-out that they were too old to fight! The captain in charge, a T.H. Wirak, said that they could help the war effort more by boosting the morale of these young troops. They were world famous characters and would do better with the U.S.O. Bob Hope was assembling a group of entertainers and would be glad to have them come along. Traveling all over the world with Betty Grable and Marlene Dietrich appealed to Max and Buddy. But they still wanted to get in on the war.